LAST MONTH, an exhibition of four art pieces inspired by the human skeleton went on display at ROC’s Harden Road office. The works were completed by Ian Barrie, a young man from Raleigh, studying art in the Boston area. He also happens to have scoliosis and was treated by me with a spinal fusion. The art is colorful and playful, exploring the natural shapes with a somewhat stylized line and in fanciful colors. I find the pieces whimsical and joyful and they are well worth stopping by and viewing. "Ever since I had my spinal fusion surgery I became fascinated with the internal structure. As I am studying to be an artist, I want to go into further exploration. So I decided to create visual representations of various parts of the internal structure. In my work I like to explore different styles of mark making, movement, and color. " Although he acknowledges that his medical condition and subsequent care inspired his interest in the skeletal system as a form, Ian told me that he was not necessarily making a statement about his own health, and merely exploring the shapes and textures. However, his two pieces that include the spine both feature complex twists and turns. It is hard to imagine that the curvature of his own spine did not play into his treatment of these images. Art has often been solace and catharsis for an artist’s own infirmity. Artists such as Van Gogh have used the canvas to express the inner turmoil of their psychological despair, yet have found ways to soften their own mortal terror with images of amazing loveliness and gratitude. Toulouse-Lautrec may have designed his elongated and motive figures to reflect his ambivalence about his painful dwarfism, yet his artwork is alive and vivid. Freda Kahlo is famous for the stark images of pain which reflected her own physical sufferings, yet her art is as colorful as carnival in its tonal composition. Scoliosis has often arisen as the inner image of the artist’s psyche and is also depicted in a wide range of emotive settings. Scoliosis is featured by classical artists in ultra realistic images of twisted and crippled old age, or images of snakes curved along the ground. But in another famous work, Rubens’ “Three Graces”, one of the deities with her back directly to the viewer has an unmistakable rib and hip prominence. For all her scoliosis, she is as lithe and beautiful as her straighter sisters. 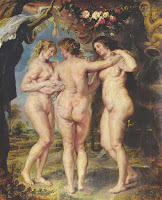 Rubens' "The Three Graces". The Grace with her back to the viewer has an unmistakable curve. In 2007, the AAAOS held an Orthopaedic art competition to celebrate its 75th anniversary. Although all aspects of orthopaedic care are represented, spine and scoliosis make up a significant percentage. They range from architectural forms exploring the masterful design of the spine to figure drawings and paintings of the scoliotic form. One of the most arresting and stark artworks I have ever seen is that by Laura Ferguson of a solitary figure wrapped around herself with her curved spine exposed to the canvas. The earthiness and honesty of that artwork are especially moving. Elsewhere in the collection is a crystal “caduceus” made up of a scoliotic spine that is both uplifting and jovial. Our local artist’s work is neither tortured nor despairing. It is fun and clever, a sense of peace and wonder purveying. I wonder if the very act of making such art serves as catharsis for the multitude of artists I encountered on the web. I certainly hope that those artists find some peace through their expression. I heartily recommend browsing the scoliosis artwork on the web. As a doctor with a keen interest in spine and in the development of children, and more important, as a human being with what I hope is a high degree of empathy, I was profoundly moved and changed by the images I saw and the words that I read.